Did a motherboard swap on a trusty old computer that ran ubuntu for 10 years or so. Now it only runs windows (same hardware fresh installs windows with no issue). brand new ryzen 2nd gen with graphics. I know about graphics drivers issues, wasn't expecting that to be dealt with. Just trying to use it as a cpu. So I put in an older (RADEON HD 7850 pitcairn) video card to get some functionality. Without the video card, it boots, but the display is unusable. I can ssh in and see that it works fine as a server, but cannot use terminal or graphical display. I think it just went into a blank screen. 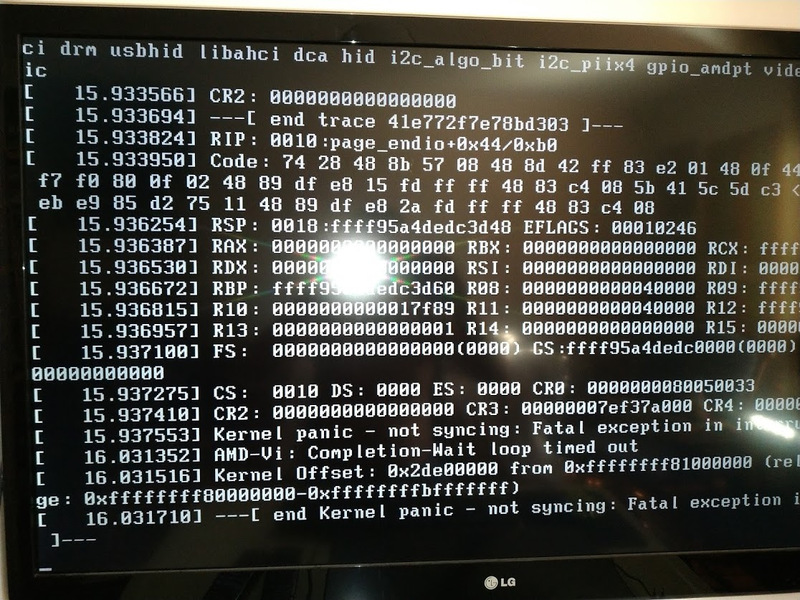 I tried rcu_nocbs=0-7 as and argument booting the march 3rd daily iso. (reported as helping by one user on phoronix) but no change. tried again with 03/11 daily after beta announcement. No change. Are you still having this issue with the final release? > Are you still having this issue with the final release? I can only boot in windows... cannot boot in ubuntu to choose the custom kernel. 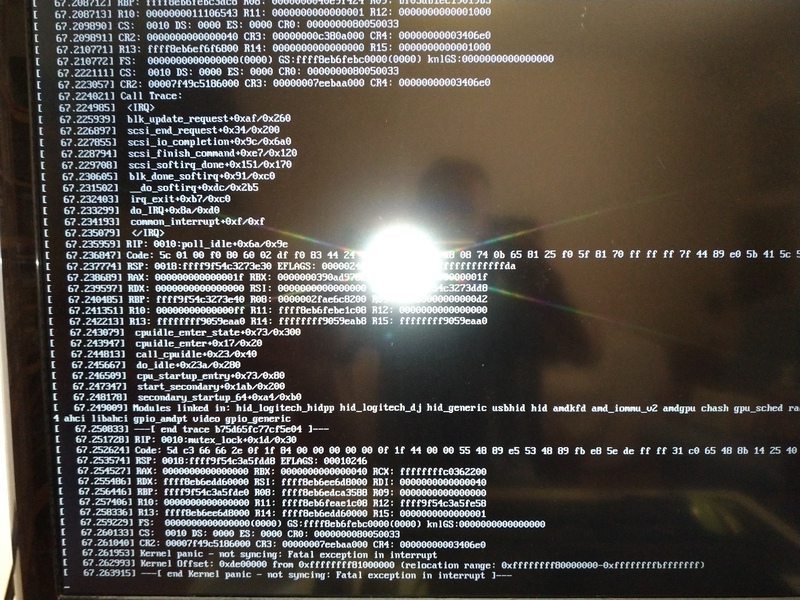 any idea how to adjust an installation image to use a custom kernel? OK, took the boot disk out, and installed the 4.17-rc7 from the above location, and it still does not work. same loop as before. I mean I put it in a usb enclosure, so now I can move it to a PC that I can boot linux on, and make changes, and then easily move it back to try booting. so easy to test now. I tried to mark the report confirmed, but couldn´t because I am the original reporter.. I guess. Mar 3 22:08:10 alu kernel: [ 185.523286] [drm] DC: Cursor address is 0! Mar 3 22:08:16 alu kernel: [ 191.147354] [drm] DC: Cursor address is 0! Mar 3 22:08:16 alu kernel: [ 191.148362] [drm] DC: Cursor address is 0! Mar 3 22:08:16 alu kernel: [ 191.374531] [drm] DC: Cursor address is 0! Mar 3 22:08:16 alu kernel: [ 191.375536] [drm] DC: Cursor address is 0! Mar 3 22:08:16 alu kernel: [ 191.389098] [drm] DC: Cursor address is 0! Mar 3 22:08:16 alu kernel: [ 191.390110] [drm] DC: Cursor address is 0! Mar 3 22:08:16 alu kernel: [ 191.405736] [drm] DC: Cursor address is 0! Mar 3 22:08:16 alu kernel: [ 191.406737] [drm] DC: Cursor address is 0! Mar 3 22:08:16 alu kernel: [ 191.735683] [drm] DC: Cursor address is 0! Mar 3 22:08:16 alu kernel: [ 191.736609] [drm] DC: Cursor address is 0! Mar 3 22:08:16 alu kernel: [ 191.756004] [drm] DC: Cursor address is 0! Mar 3 22:08:16 alu kernel: [ 191.757035] [drm] DC: Cursor address is 0! Mar 3 22:08:22 alu kernel: [ 197.327221] [drm] DC: Cursor address is 0! Mar 3 22:08:22 alu kernel: [ 197.328229] [drm] DC: Cursor address is 0! Mar 3 22:08:22 alu kernel: [ 197.582181] [drm] DC: Cursor address is 0! Mar 3 22:08:22 alu kernel: [ 197.583143] [drm] DC: Cursor address is 0! Mar 3 22:08:22 alu kernel: [ 197.588987] [drm] DC: Cursor address is 0! Mar 3 22:08:22 alu kernel: [ 197.589997] [drm] DC: Cursor address is 0! Mar 3 22:08:22 alu kernel: [ 197.605801] [drm] DC: Cursor address is 0! Mar 3 22:08:22 alu kernel: [ 197.606811] [drm] DC: Cursor address is 0! Mar 3 22:08:23 alu kernel: [ 197.926448] [drm] DC: Cursor address is 0! Mar 3 22:08:23 alu kernel: [ 197.927348] [drm] DC: Cursor address is 0! Mar 3 22:08:23 alu kernel: [ 197.938932] [drm] DC: Cursor address is 0! Mar 3 22:08:23 alu kernel: [ 197.939960] [drm] DC: Cursor address is 0! Mar 3 22:08:28 alu kernel: [ 203.542948] [drm] DC: Cursor address is 0! Mar 3 22:08:28 alu kernel: [ 203.543955] [drm] DC: Cursor address is 0! Mar 4 08:23:55 alu kernel: [37130.167508] [drm] DC: Cursor address is 0! Mar 4 08:23:55 alu kernel: [37130.168529] [drm] DC: Cursor address is 0! Mar 4 08:24:00 alu kernel: [37135.194254] [drm] DC: Cursor address is 0! Mar 4 08:24:00 alu kernel: [37135.195262] [drm] DC: Cursor address is 0! Mar 4 08:24:01 alu kernel: [37136.136335] [drm] DC: Cursor address is 0! Mar 4 08:24:01 alu kernel: [37136.137343] [drm] DC: Cursor address is 0! Mar 4 08:24:06 alu kernel: [37141.159515] [drm] DC: Cursor address is 0! Mar 4 08:24:06 alu kernel: [37141.160539] [drm] DC: Cursor address is 0! the behaviour changed, and it got out of the initial loop, but eventually it still crashed. The amdgpu driver in Bionic is not new enough. 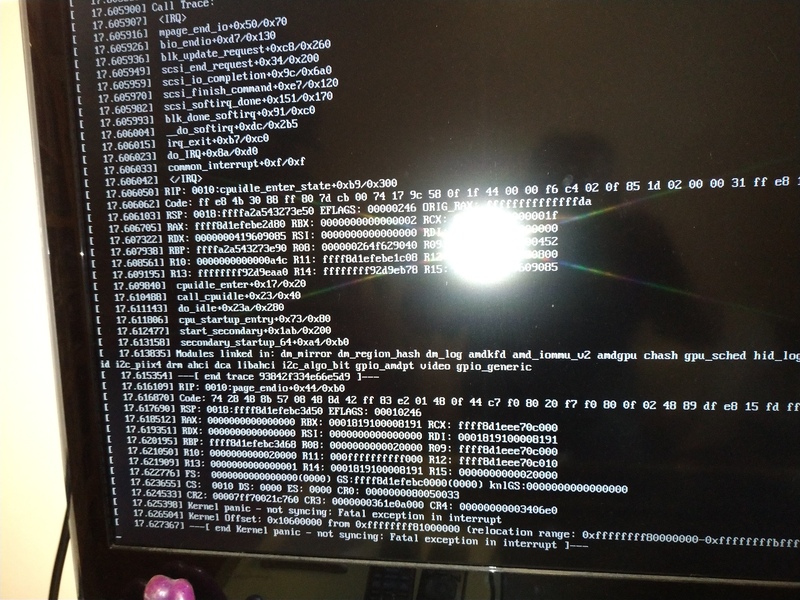 Please try mainline kernel and latest firmware from . OK updated firmware, including amdgpu. Did you upgrade the initramfs after firmware update? 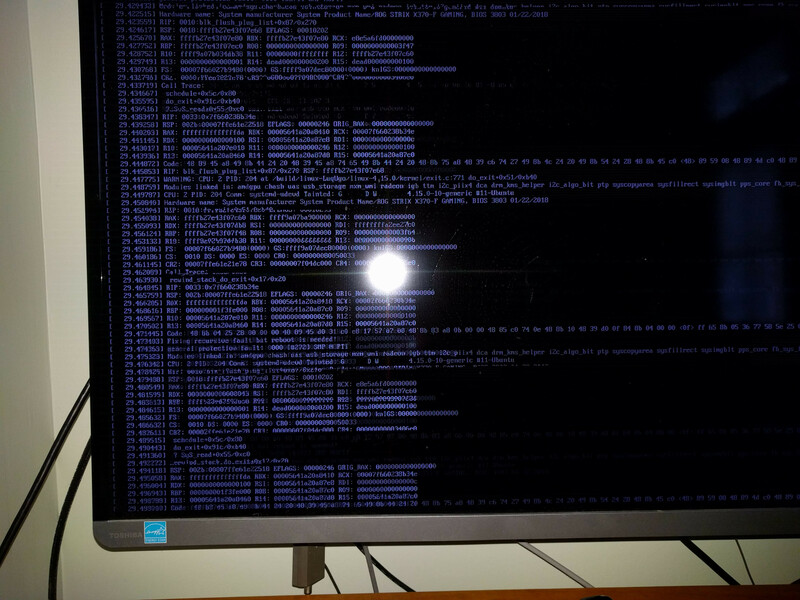 Run `sudo update-initramfs -u -k all`. OK did that. the crash is a little different. 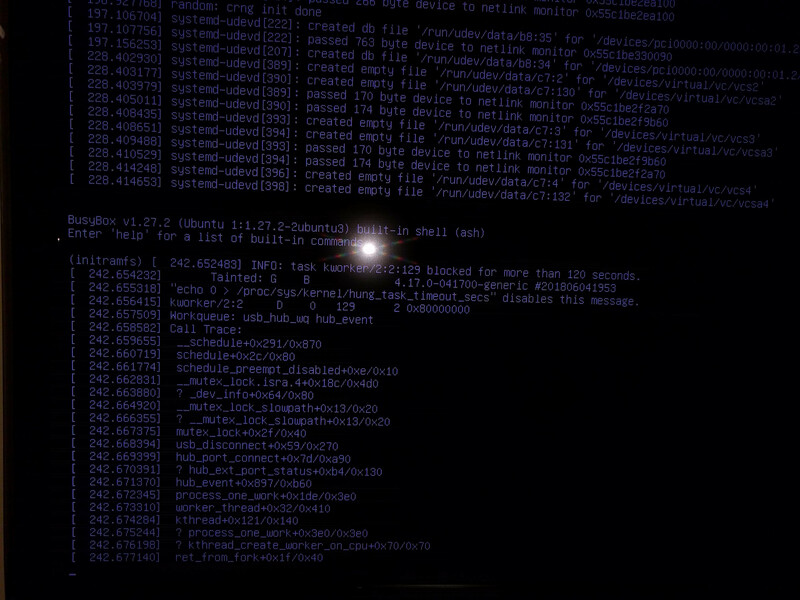 OK, now it dumps into the (initramfs) prompt but at least it doesn´t crash just sitting at that prompt. any suggestions what to do once at the initramfs prompt? Isn't Ryzen 2400G a 8 threads processor? yes: 4 Cores/8 Processing Threads, I tried 0-7 and 0-3. 0-7 crashes worse than 0-3. I could imagine the number being related to cores, rather than threads. tried 4.18.rc1 rcu_nocbs=0-3: crashes into initramfs as before. with rcu_nocbs=0-7: it goes into some sort of infinite loop spewing registers on the console. Have you tried kernel parameter "nomodeset"? tried nomodeset. now there is no mode set while booting, and goes into a boot loop. tried again 4.17.4 upstream and mesa 18.2 from oibaf. no change. when I am lucky, I get into (initramfs) prompt. Can you see what's wrong in dmesg, when in the initramfs prompt? 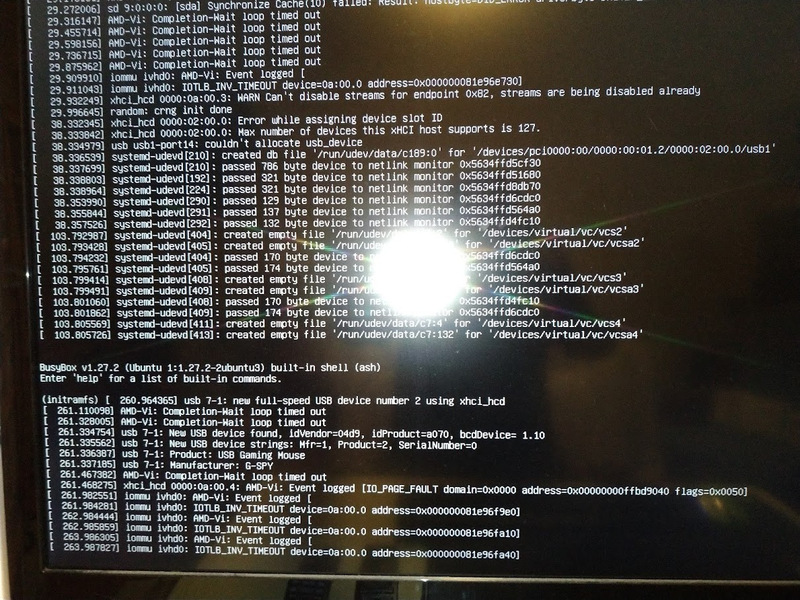 I cannot get into initramfs anymore... it just loops during boot. image attached. similar image available for 4.17.4 if desired. For Ryzen APU, is it possible to try latest mainline, 4.18-rc6? For Radeon 7850, try kernel parameter "radeon.si_support=0 amdgpu.si_support=1"
then kept printing some messages a few minutes later. 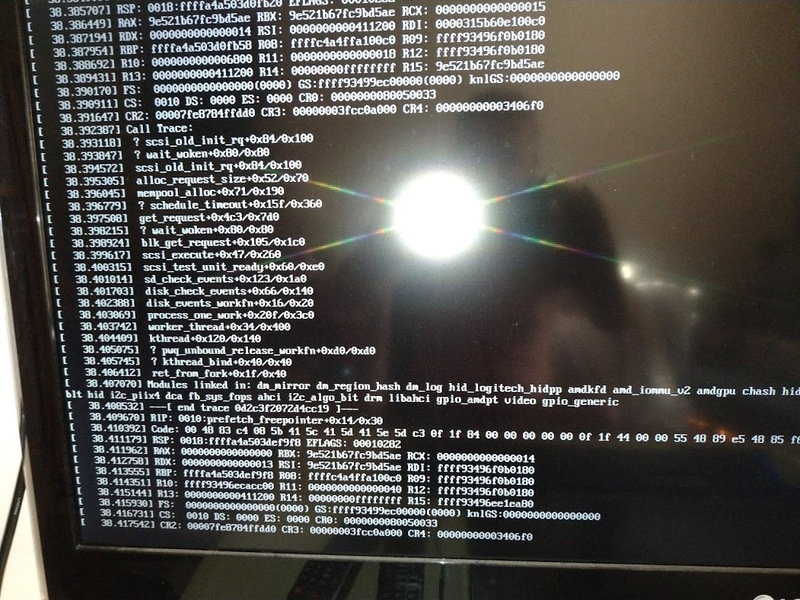 I also tried booting with none of the workarounds (no_spectrev2, rcu_cbs, radio, amdgpu) it looped on boot. just like back in 4.15.
upgraded everything: firmware, mesa, kernel (rc7.) Now it crashes. First crash was different from subsequent ones. Have you tried latest amdgpu ? get correct configs and such. driver. Haven't had to build a kernel from source in 15 years or more. from the kernel? or do I just make, make install ? > Have you tried latest amdgpu ? > to get correct configs and such. > driver. Haven't had to build a kernel from source in 15 years or more. > from the kernel? or do I just make, make install ? >> Have you tried latest amdgpu ? fwiw, I got this far... not sure what would be next. >> to get correct configs and such. >> a driver. Haven't had to build a kernel from source in 15 years or more. >> from the kernel? or do I just make, make install ? >>> Have you tried latest amdgpu ? Error! Your kernel headers for kernel 4.18.0-rc1+ cannot be found. it behaves similarly to the others. The first time I booted it eventually dropped into initramfs) prompt, but would not accept keyboard input. 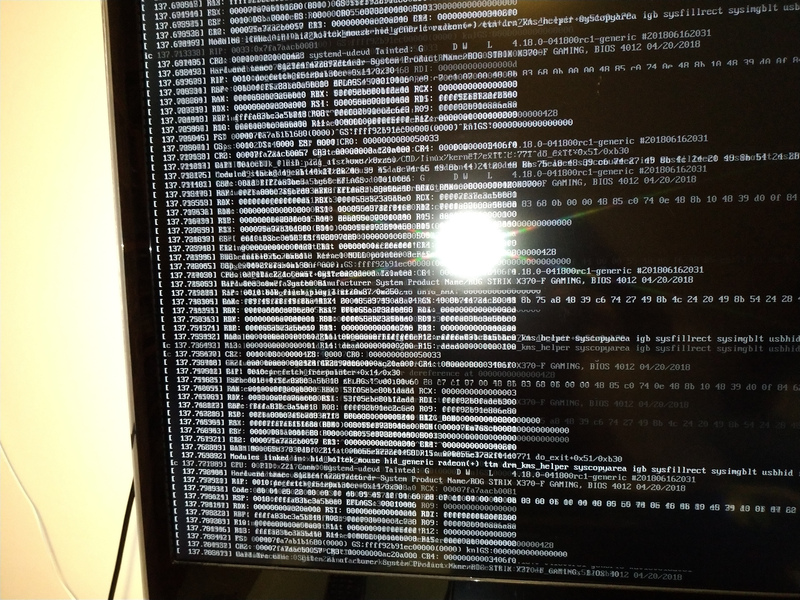 subsequent boot was and endless loop of register dumps. but I would have to order the cable. Recommendations welcome. If so, it would be easy to just connect and leave it that way for hours. usb-3, then I need a second USB-3 host and it's a bit more cumbersome. > Error! Your kernel headers for kernel 4.18.0-rc1+ cannot be found. > input. subsequent boot was and endless loop of register dumps. tried again with 4.19rc2. Stripped off all other usb peripherals (including existing mouse & kb), only had the internal (windows) SSD and the usb one I am plugging in. Now using a logitech K400 or so, which seems compatible with everything. When I boot, it dumps me into (initramfs) prompt, and I can use it. If I do ls /dev, I see sda, sda1, sda2, sda3 and no other disk partitions. When I try to mount them, I find they are the windows SSD that is SATA connected. It doesn't see the externally USB connected drive. 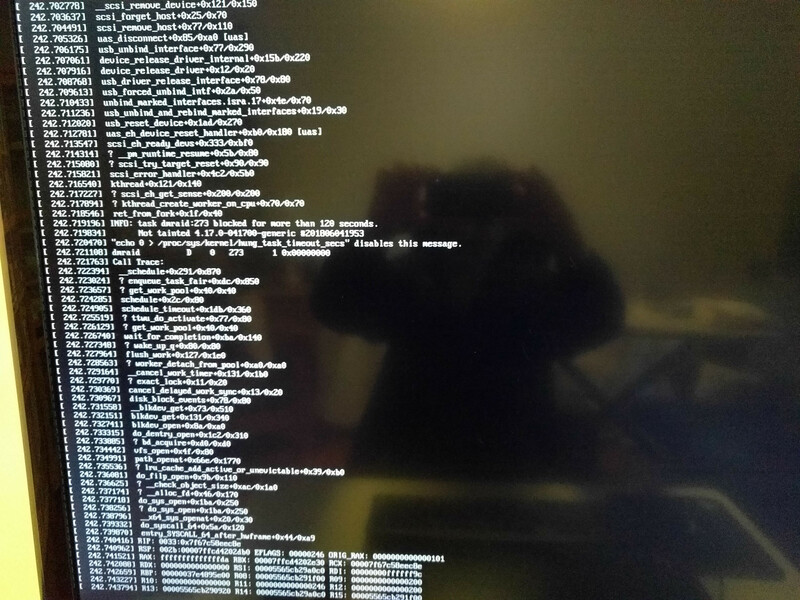 So I disconnected the windows SSD, removed the other SSD from the enclosure and connected it the ubuntu SSD via SATA. Now I can get a reproducible crash. picture coming.